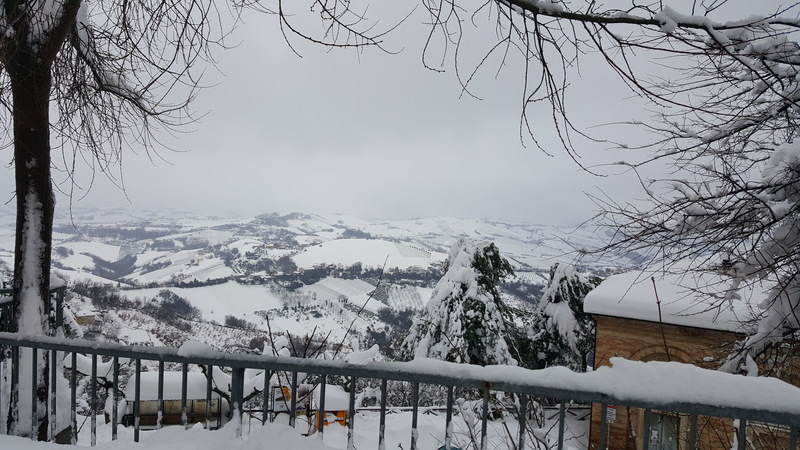 The village of Ripatransone proudly rises to an elevation of 494 metres and sits dominantly atop a hilly massif between the Menocchia and Tesino rivers. During the middle ages the town was named Propugnaculum Piceni reflecting its natural strategic position. To further bolster its defences, a wall was constructed in the ninth century, and restored a number of times up until the sixteenth century. Today the town, which numbers approximately 5,000 inhabitants, covers an area of little more than 7,000 hectares. A combination of the town’s hill-top position, turreted walls and the indented coastline below, made it virtually unassailable. Earliest settlement of the area dates as far back as prehistory. Today’s Ripantransone was known as Cuprae Mons by the inhabitants of Cupra and in Roman times formed part of the Ager Cuprensis. There is compelling evidence to suggest that today’s vllage derives it name from the ancient “Transone” family, of Frankish stock, who unified the four small neighbouring hillforts (Monte Antico, Capodimonte, Roflano and Agello) in the ninth century. The four castles were subsequently officially unified in 1096 in accordance with the wishes of the Bishop of Fermo, Ugo (or Ulcaldino). During the first half of the ninth century the Marche coastline was subjected to a series of Saracen attacks on the orders of Admiral al-Sabah. The local population responded to a call to arms successfully repelling the Saracen onslaughts. Although the castle withstood the attacks it sustained substantial damage and extensive parts had to be rebuilt with the help of the Franks. At the end of twelfth century, the Marche became the centre of a territorial dispute between the papacy and the Holy Roman Emperor, Henry VI, who ordered his ruthless seneschal, Maracoaldo, to quash the obstinate resistance of the inhabitants by storming and destroying the stronghold. They attempted to do so in vain with the papal army running roughshod over the interlopers. The victors subsequently undertook a reconstruction programme which would fortify the castle’s defences against future invaders, and renamed it Ripatransone. 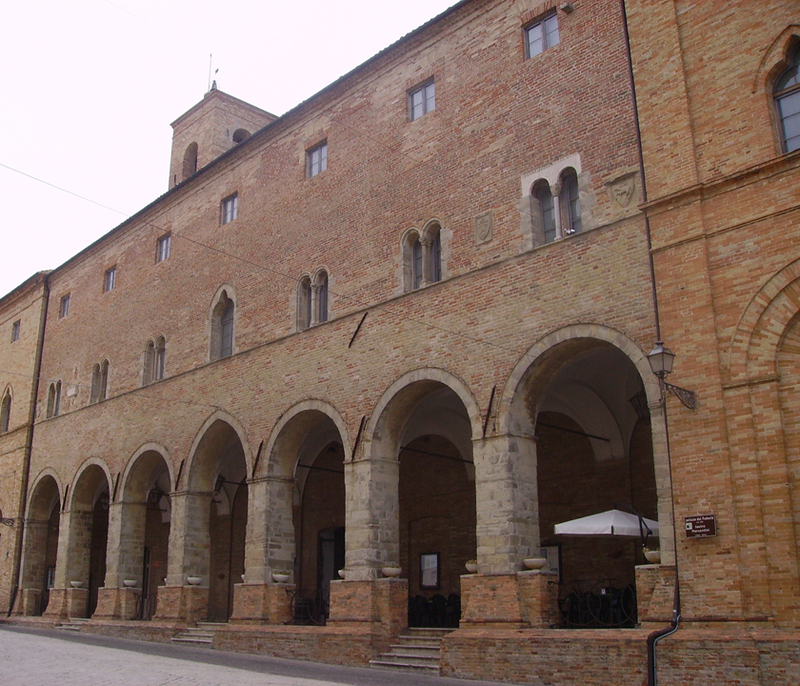 In 1205 the community claimed eligibility to independence from Fermo and requested that it be awarded township status The year 1255 saw other assaults launched by an alliance formed between Acquaviva, Offida and the Bishop of Fermo. Once again the stronghold withstood the attacks and the enemy retreated. 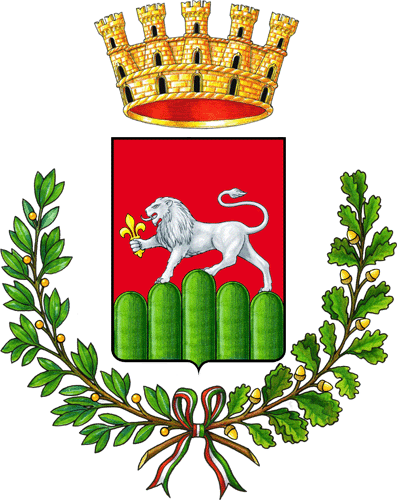 Ripatransone became increasingly important to such an extent that in 1571 it was made an episcopal town by Pope Pio V.
The village’s coat of arms is of a shield dipicting a silver lion with a golden fleur-de-lis in its front right paw mounted on five symbolic hills against a red background. The central portion of the coat of arms is surmounted by the crown of the city and cradled by a laurel branch, occasionally being replaced by an oak branch. The hills represent Belvedere, Monte Antico, Capodimonte, Roflano and Agello, traditionally considered to be the five most elevated points of the city. These days Ripatransone’s history can be traced back through its rich architecture and original layout. 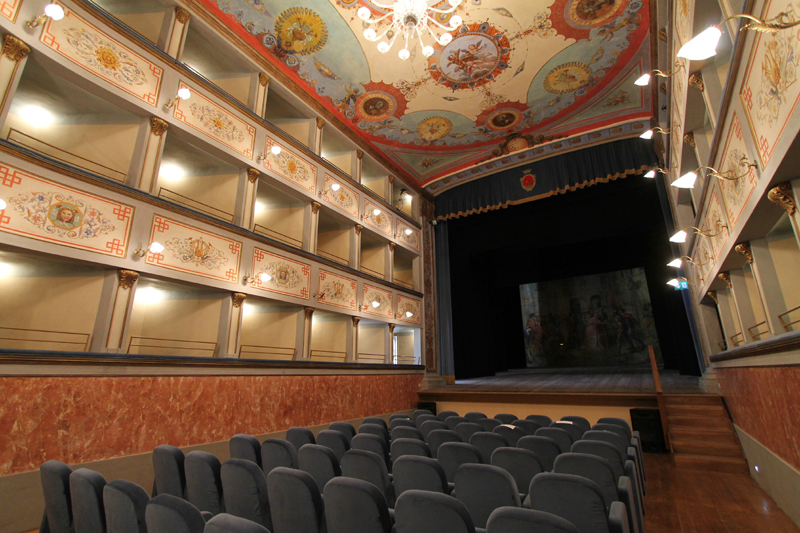 The location retains much of its medieval character and boasts a number of Reinassance and Baroque buildings, not to mention the stately buildings of the seventeenth and late eighteenth centuries which include the historic theatre, “Luigi Mercantini”. A visit to the archaeological museum, museum of episcopalian religious art, the library, art gallery, the collection of plaster casts, the museum of the Risorgimento and the ethnographical museum rounds off the tour. Ripatransone is a location steeped in art, whose main income is from tourism, the furniture industry and agriculture. High soil ferltility yields a bounty of Mediterranean crops and is especially suited to the cultivation of olives and vineyards. Another feature of the landscape is the badlands characterised by grooves caused by soil erosion, which give the land a lunar appearance typical of the area and common in the Marche. The so-called “cuccelù” or snails and “ciavarro”, a mixed legume soup are two of the local speciality dishes. “…. 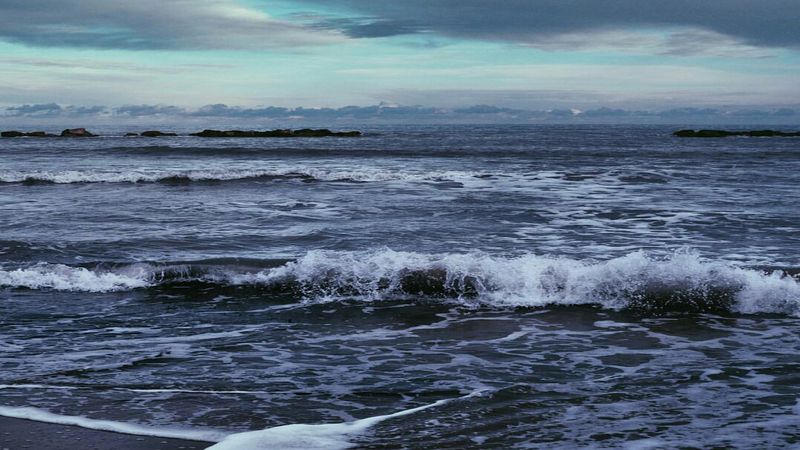 who having seen nature from on high have been much by it inspired“. It is perhaps because of the vista, as hinted at by Archbishop Rinuccini in his “Cappuccin Scozzese”, and to its inspiration that so many illustrious names of Ripatransone owe their talent. Among them are Giovanni da Ripatransone, a fourteenth-century philosopher, Ascanio Condivi, pupil and biographer of Michelangelo Buonarroti, G.Cellini, leader of the 1799 anti-French revolt, Luigi Mercantini, poet and Risorgimento scholar; Emidio Consorti founder of vocational education, Adolfo Cellini, a theologian, exegete and man of letters, Ivo Illuminati, a silent movie director, Uno Gera a magistrate, sculptor and philanthropist, Aldo Gabrielli writer of children’s books and linguist, Giuseppe Canali an artist, Luciani Neroni an opera singer and Ildebrando Malavolta a valorous Second World War pilot. No less renown are the legends that tell of the valiant acts of heroism by Ripantrasone’s womenfolk. The martyred Virginia preferred to be killed by her father’s hand rather than being left to the mercy of Spanish mercenaries, who had infiltrated the castle in 1515 by a ruse. In memory of the young woman’s virtue, the stage curtain in the “Luigi Mercantini” theatre depicts scenes from this tragic episode. Another legend recounts the new Spanish hordes and the story of Donna Bianca de Tharolis-Benviganti who boldly pursued the enemy on her steed and killed him. The eponymous main square in the village was built to commemorate her memory. 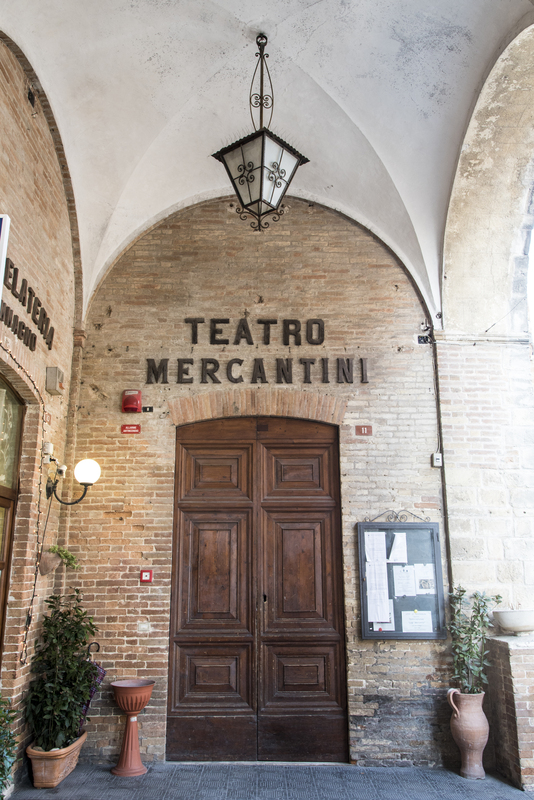 The local Luigi Mercantini Theatre initially bore the name “Del Leone” and shares the traditional profile of other historical theatres in the Marche. It was completed at the end of the eighteenth century and inaugurated on 16th September 1790. It is located within the Palazzo del Podestà, a fourteenth century building in Roman-Gothic style and has an elegant colonnade with seven arches, which at the time served as the commissioner and the governor’s offices as well as housing a large fourteenth century hall. The local community wanted a theatre as a showcase for the nobles and place for the younger members of the community to socialise. 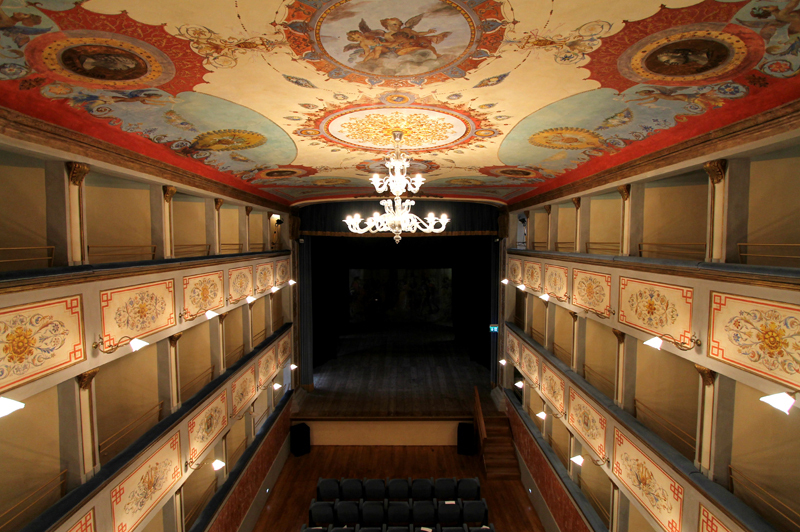 The theatre was designed by the architect Pietro Maggi and its construction was overseen by the engineer Magistretti from Milan, who at the time was a secondary school teacher in Fermo. The theatre is fitted with stalls and a three-tier balcony. The interior decoration is in the neoclassical and eighteenth-century styles. Two cupids holding a basket of flowers are depicted in the two central medallions of the archway framed by flourishes. The six medallions running lengthwise along the ceiling made in imitation bronze and marble each depict the individual profiles of the three musicians Bellini, Rossini and Verdi, and the three playwrights Alfieri, Golden and Metastasio. Along the parapets of the second-tier two pairs of trumpets with a lyre in the centre and two swans to the side set alternately with a mask, two trumpets and acanthus leaves. The row of third-tier parapets are decorated with alternating floral designs of a rose and rose window both of which are festooned with palmettoes and ancanthus leaves. The central parapet of the same tier displays a pan flute and another wind instrument tied togehter with a white ribbon surrounded by oak leaves. The village crest is displayed on the parapet of the VIP box and depicts a lion standing square on five hills. Luigi Mercantini (1821 – 1872). was a man of letters, a patriot, a university professor. His poems and songs are the most well-known and important. One of his best-known poems is “La Spigolatrice di Sapri”. This poem describes the scuppered landing at Sapri by the revolutionary leader Pisacane and is told through the eyes of a poor woman gleaning laboriously in a field. The peasant woman who witnessed the landing met and fell for the rebel leader. She sides with him and his three hundred troops who all fall in battle at the hands of the Bourbon army. 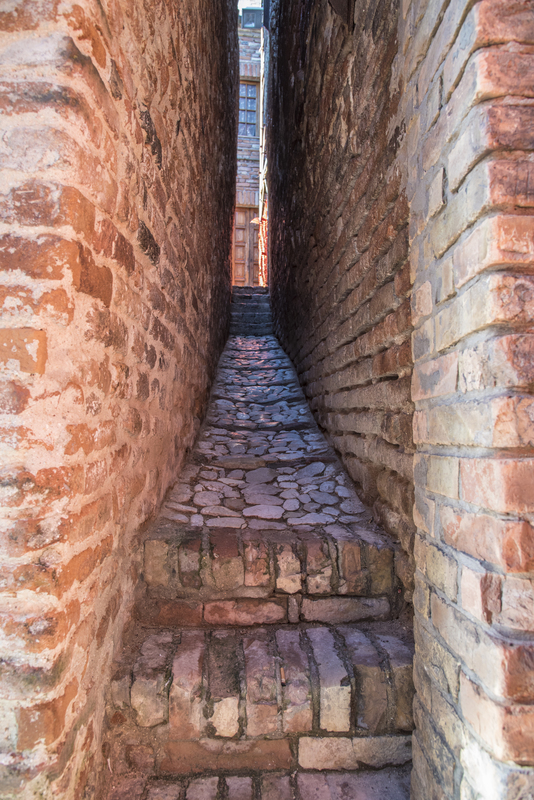 Besides the numerous squares, spendid churches and defensive walls, Ripatransone is also proud to boast the narrowest lane in the country. It connects two ancient roads which run parallel one above the other. At its top end it is 43 m wide narrowing downwards towards the middle to 38 cm. Despite being so narrow it is possible to walk down the lane in complete safety, as it is paved and lit by a window on one side. The Gate of Monte Antico: an ancient gateway to the city on the approach from Grottammare is one of the several fortified gateways safeguarding the inhabitants. 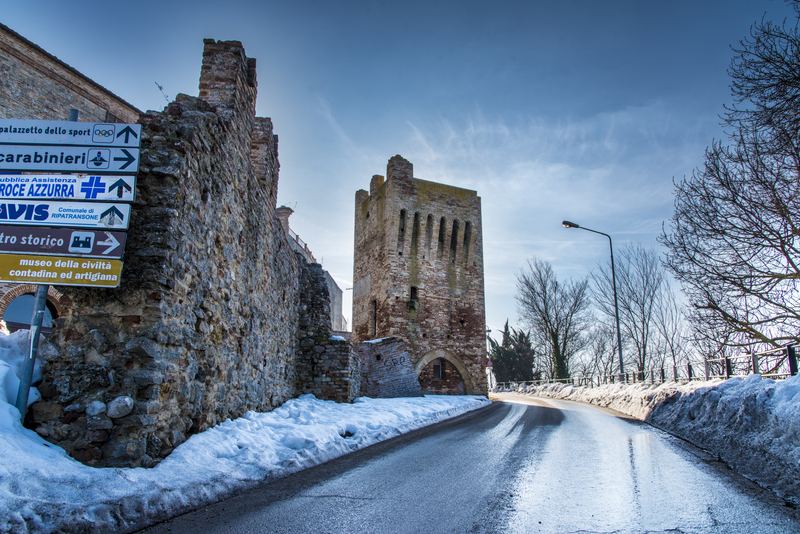 It takes its name from one of the four small castles which formed the original village. The gateway is located in the south-west part of the village. 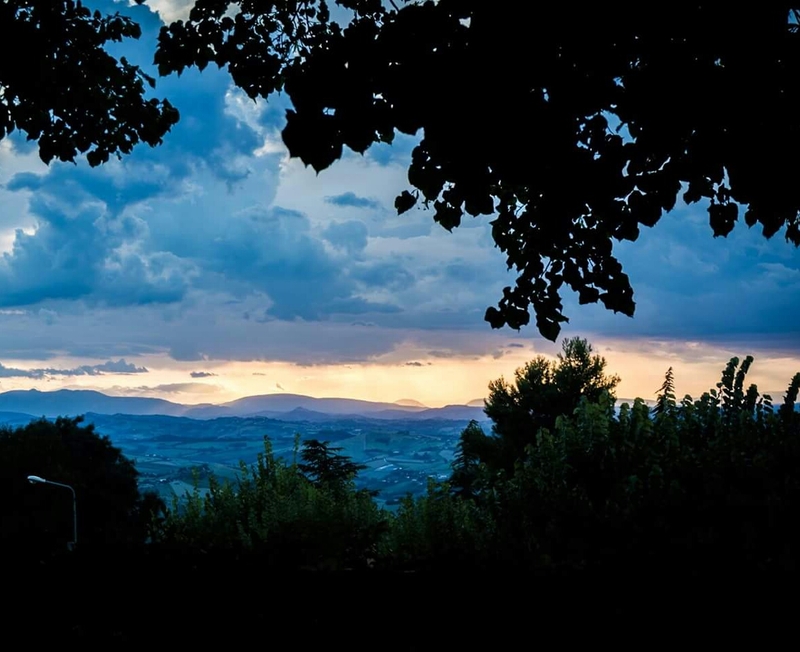 Its position affords a panoramic view over the Tesino Valley and of the mountains around the Province of Ascoli Piceno. Il Cavallo di Fuoco, is a historical re-enactment traditionally held eight days after Easter every year in the village of Ripatransone. This fireworks display is part of the community’s deeply woven historic fabric and draws several thousand spectators from Ripatransone and tourists alike. The origins of the event date back to 10 May 1682, during the Coronation of the Virgin. A pyrotechnician from Atri was enlisted by the locals for the occasion who, improvising, mounted his firework-laden horse and rode round the square throwing them all about pell-mell. This so enthused the crowd of spectators that it became an annual fixture. For the first few years a real horse was used, which was later replaced by a wooden effigy up until 1932. This in turn was also replaced with the rider being carried shoulder high by the strongest villager. Still later it was decided to fit a wooden horse with wheels which could be drawn by means of a towbar. In 1994 the horse was eventually re-fashioned from iron. 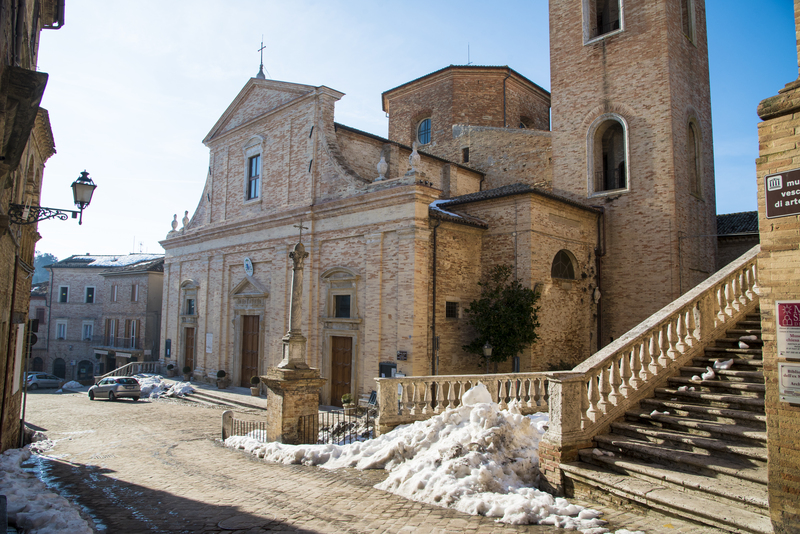 Though essentially religious in nature and organised by the cathedral’s confraternity, today the festivity is a community event dedicated to the Madonna of St Giovanni. More recently it has become customary for the bishop of the diocese to bless the horse outside the porch immeditely after giving Holy Communion. Around nine in the evening the horse is removed to be carried round the scenic town perimeter, meeting on its way the village band, whose route takes it from Piazza Condivi while playing the traditional March n.23 to proceed up Corso Vittorio Emanuele to Piazza Matteotti and Piazza Condivi in front of the cathedral. Shortly afterwards, the street lights are switched off and the fireworks ignited. 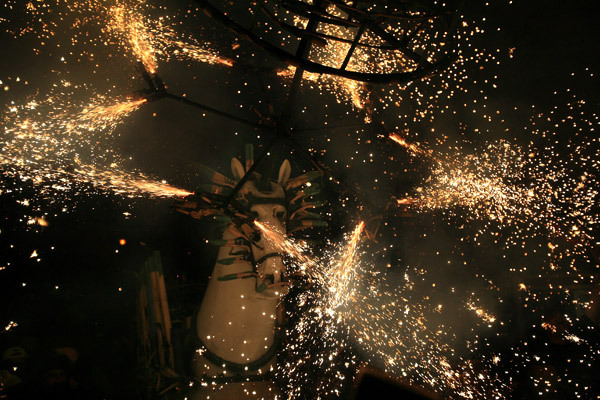 The horse, laden with firecrackers, circles the squares several times throwing out flames in every direction. The most spectacular and colourful fireworks are launched skywards, and in keeping with tradition the horse charges the onlooking crowd of spectators causing them to scatter in a panic. The fireworks are characterised by the aesthetic effects they produce, according to which special names are attributed. Worthy of mention are the so-called ‘whiskers’, which when ignited rains a shower of sparks down on the heads of an unsuspecting crowd from alternate sides, and the ‘pinwheel’. The latter is formed by a wreath of firecrackers attached to the horse’s head, which spins upwards to explode over the crowd. The whole display lasts a brief 20 to 30 minutes, after which the equine protagonist is rehoused in the depot ready for the following year’s festivities.